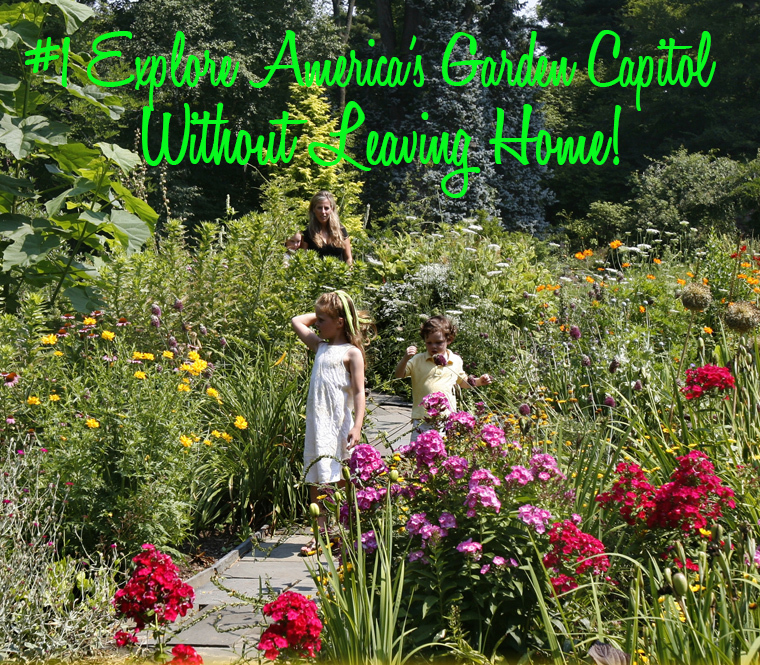 30 Gardens in 30 Miles – Explore them all! 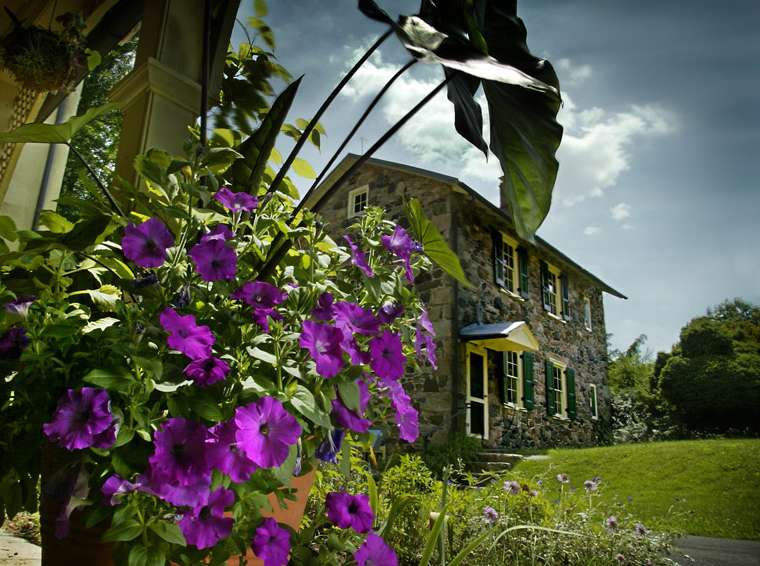 There are more 30 Philadelphia-area gardens that make up America's Garden Capital. They come in all shapes and sizes and each has a distinctive personality. 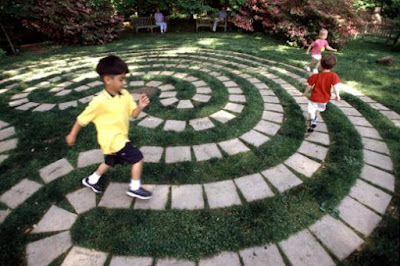 So our Bureau has created an online Guide to many of the gardens and arboretums in and around Delaware County, so you can pick and choose the places your family would love to see! For each garden there are photos, historical notes, a description, location and contact information. There is also a direct link to each garden's website so you can find out even more about those that interest you most. Within 30 minutes of Philadelphia, Chanticleer is one of the great gardens of the region. 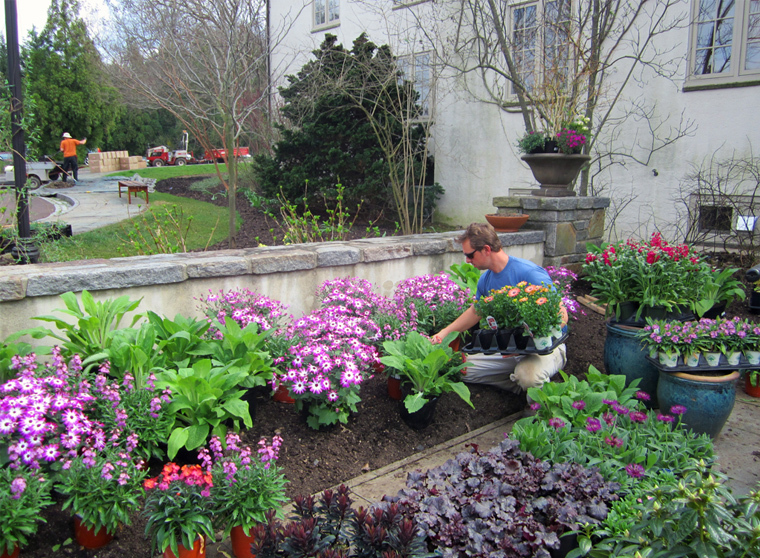 Once the Rosengarten estate, today's Chanticleer is a colorful, contemporary garden within an historic setting. Come discover why London's Financial Times calls us "planted to perfection" and Garden Design magazine says we are "America's most inspiring garden." Bell's Run (left) is a place of quiet respite with an undulating lawn planted with hundreds of blue-flowered quamash (Camassia) that bloom in the spring. It is one of the premier horticultural display gardens in the United States and is open to visitors year-round to enjoy exotic plants and horticulture, events and performances, seasonal and themed attractions, as well as educational lectures, courses, and workshops. 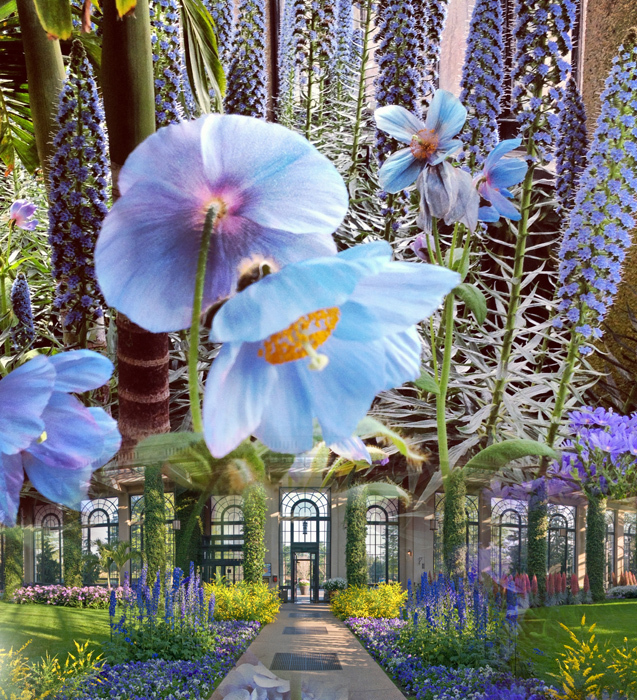 The Blue Poppies (right) are gorgeous and in full bloom in the Longwood's Conservatory. And the Main Fountain Garden which has been closed for a two year revitalization re-opens Mary 27th! This is one of the oldest and largest arboreta in the northeastern United States, Tyler Arboretum’s heritage dates to 1681, when the land that makes up Tyler was acquired from William Penn by Thomas Minshall. Today, Tyler is a valued community resource and cultural destination. 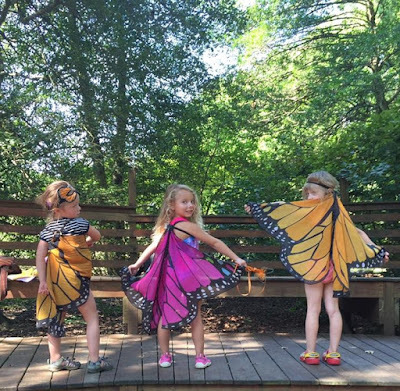 Open year round (except Thanksgiving Day, Christmas Eve, and Christmas Day ), with 650 acres and 17 miles of hiking trails, Tyler provides a natural sanctuary for families, children, and adults interested in history, nature, and horticulture. Tyler Arboretum invites you to connect, explore, and grow with nature today. A new study says Greater Philadelphia Gardens supports more than 1,500 jobs in many industries, including the arts, entertainment, and recreation. 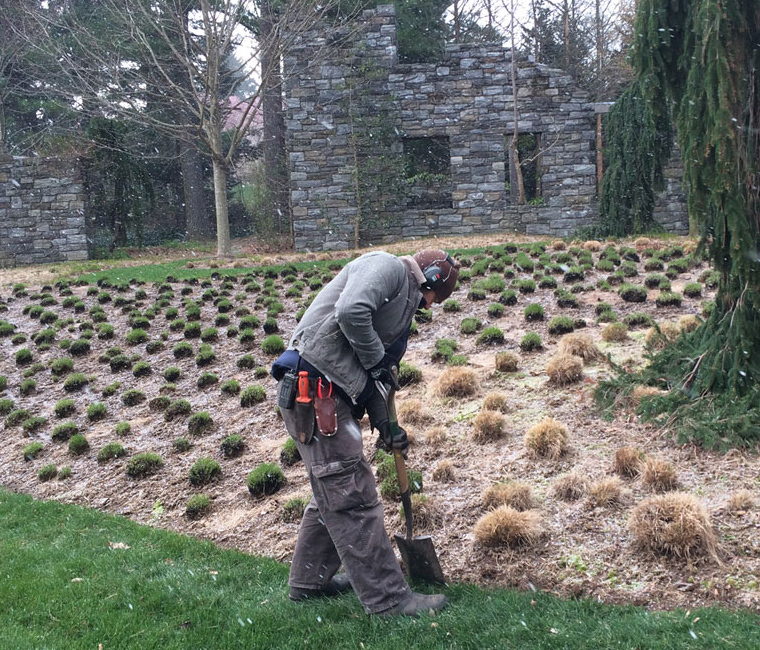 Beyond creating jobs, the gardens support local businesses and increase nearby property values. The impact is significant – about $256 million per year. If I'd been given a pair of Wooden shoes as a child, you could have plopped me down in Holland and I would have thought I was home! That's because the farm where I grew up had vegetable and flower gardens, orchards and waterways, biking trails and a very big love for cheese that looking back, is somewhat disturbing. So I was thrilled to learn that this year's Flower Show was going to spotlight Holland. 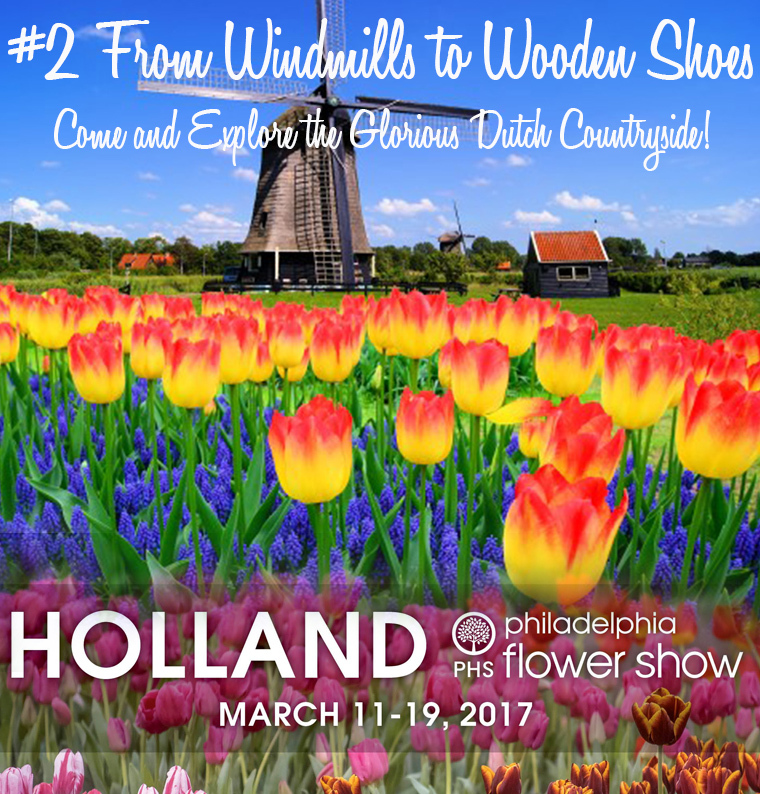 There will be wonderfully crafted windmills nestled amid flower patches bursting with color...decorations will feature historic wooden shoes and whimsical bicycles...and miniature canals will weave through vibrant tulip exhibits that hearken to the iconic Dutch landscape. 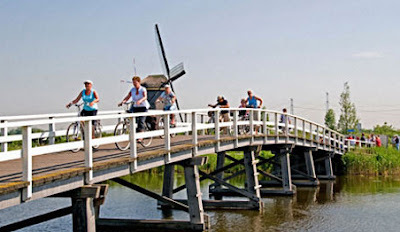 It is also the bicycle capital of the world with more than 18 million in the country - that's more than 1 bike per person! This region is also a major grower and exporter of apples, tomatoes and many other fruits and vegetables that the world enjoys -- and you'll also learn about their innovative eco-design, modern urban greening and sustainability efforts. The Netherlands (the official name for the country) exports 75% of the world's flower bulbs...along with famous beers and outstanding Dutch cheeses! 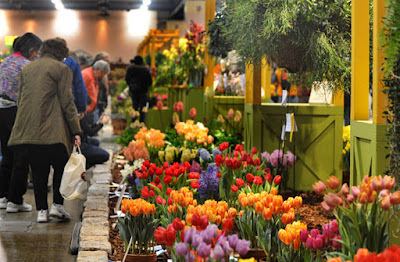 Their world-famous tulips did not not originate in Holland. 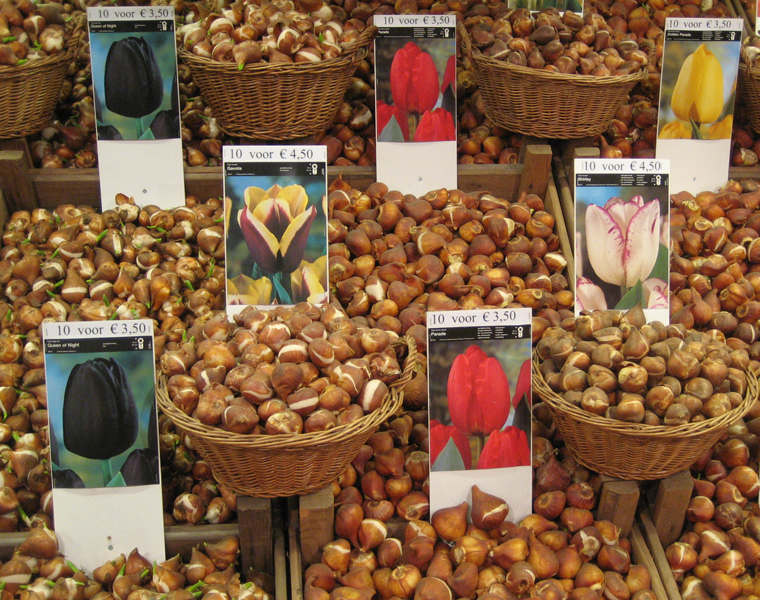 The first tulip bulbs were actually imported from Turkey. The Dutch have been making cheese since 400 AD -- and even today, Dutch cheese is considered the best in the world, as judged in the 2012 World Cheese Making Contest held in the US. Because the Dutch live so close to sea level, they have become world experts in developing methods and technology that keeps sea water at bay -- and prevents the rivers from turning The Netherlands into Atlantis! In fact during the hurricane Katrina disaster, the US government turned the Dutch for help in finding ways to keep the ocean from overrunning the city. For those visiting from out of town, click on the hotel guide below to choose from dozens of hotels and inns of all types, many of which are just 20 minutes or less from the convention center. Most famous gardens are sweeping and grand. They arc across acres of landscaped ground like glorious banners of beauty. Their song is an anthem - and it is a 'moving' one. 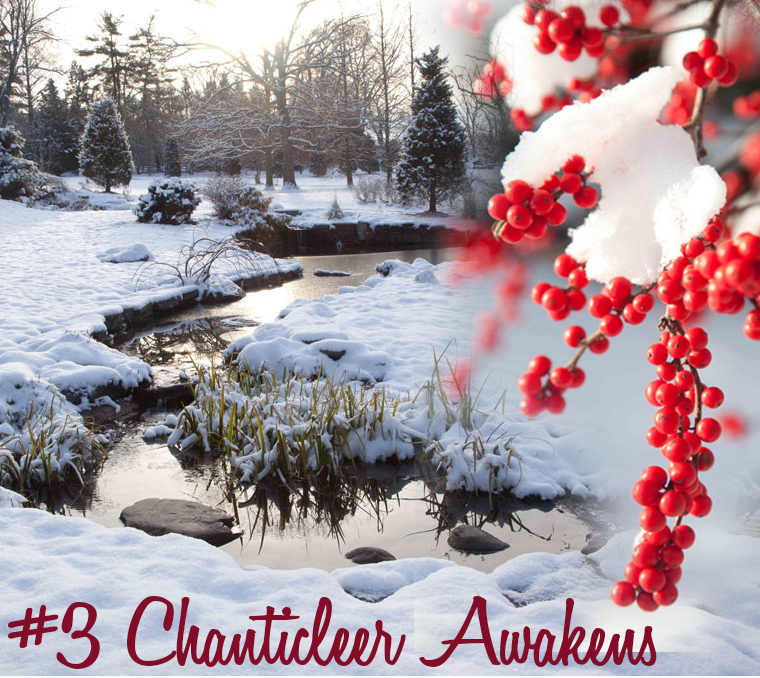 But Chanticleer is filled with quiet magic. It is a petite yet sumptuous 35 acres, where every few steps there is something new to see. 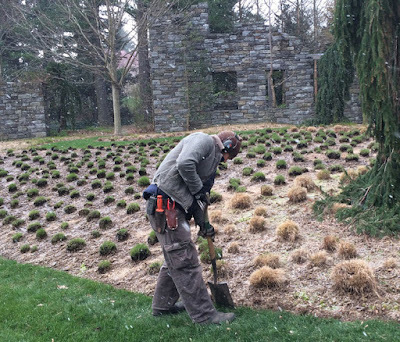 It officially opens March 27th, preparing for spring with new plantings, trimmings, and sculptural additions to make this a stunning new season for the garden. still open to the public. The garden has evolved greatly since the death of the owner in 1990. 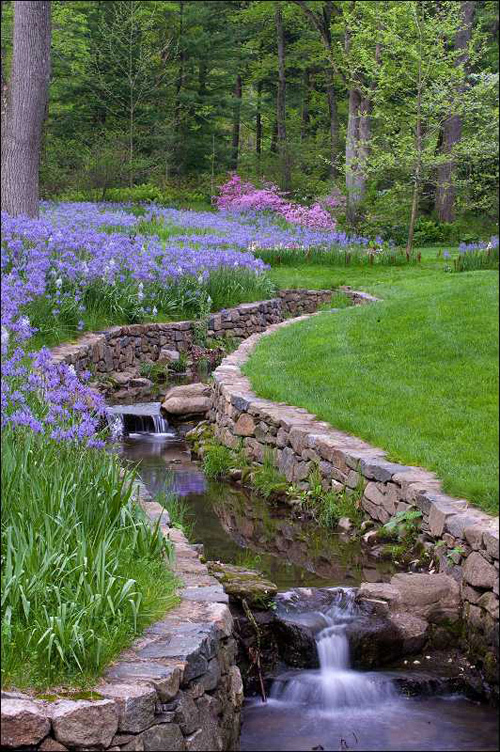 Although is was a beautiful as the home of the Rosengartens, most of the floral and garden development you see today has occurred since 1990, designed by Chanticleer staff and consultants. The Teacup Garden and Chanticleer Terraces feature seasonal plants and bold-textured tropical and subtropical plants. These areas change greatly from year to year. 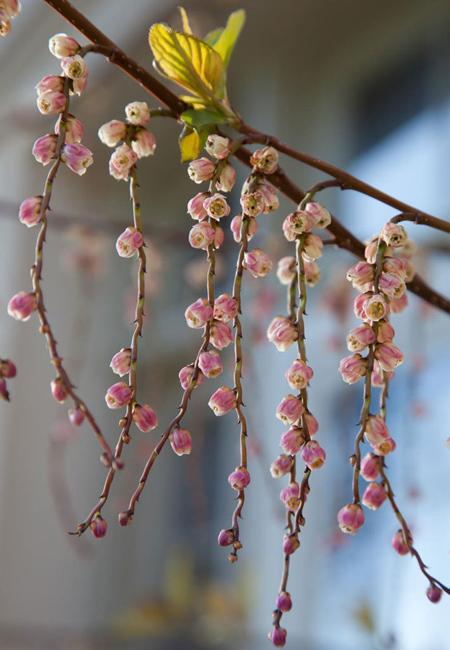 Non-hardy plants overwinter in greenhouses and basements. The Tennis Court, Ruin, Gravel Garden, and Pond Garden focus on hardy perennials, both woody and herbaceous. The Gravel Garden is hot and dry, a touch of the Mediterranean in Pennsylvania. Asian Woods and Bell's Woodland are shady areas. The former features natives of China, Korea, and Japan; the latter, plants of eastern North America. The Serpentine Garden celebrates the beauty of agricultural crops. Season passes may be purchased before March 29th at 2016 rates. 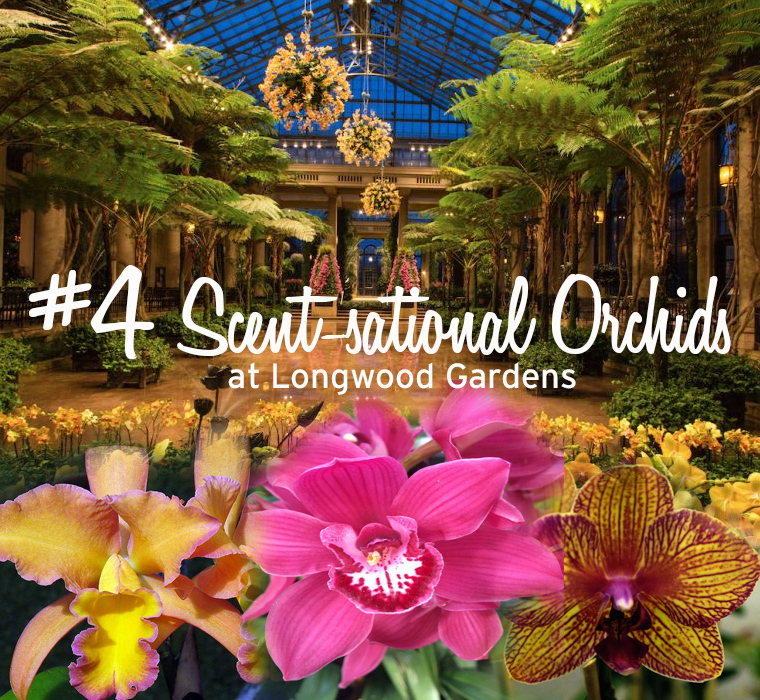 This is your last chance to be wowed by Longwood's largest and most show-stopping display of orchids ever, featuring more than 4,500 vibrant orchids inside Longwood Garden's warm Conservatory, Peirce-du Pont House, and Visitor Center -- because the exhibit ends March 31st! As one of the first plant collections at Longwood, orchids have held a place of distinction since 1922. Their talented horticulturists celebrate the beauty and variety of orchids with an artful display that includes a towering 12-foot-tall archway made up of pink Phalaenopsis orchids, giant orbs of orchids, a spectacular purple and white orchid curtain, and more than 200 colorful Vanda hanging from above in the Silver Garden. March 18th is "Or-kid" day, full of great family fun activities. But everyday this month is good day to explore the orchids firsthand -- plus the rare sky-blue poppies (pictured right) will be in bloom in the Conservatory. Orchids are the very first flowering plant in history? YES! The first evidence of orchids ws during the age of the dinosours, 120 million years ago. Orchids are hard to grow? NO! Most orchids are not difficult... and some are almost indestructible. Orchids Grow All Over the World? YES. Over 30,000 species of orchids inhabit every corner of the planet except for the driest deserts and Antarctica. Unlike most plants, they do not grow in soil, but in the air? YES! The roots attach to trees or rock where they capture moisture and nutrients. Longwood Gardens consists of over 1,077 acres of gardens, woodlands, and meadows in Kennett Square, Pennsylvania, United States in the Brandywine Creek Valley. It is one of the premier horticultural display gardens in the United States. In the United States The Irish Tenors are one of the most successful Irish touring acts ever, second only to U2. And on St. Patrick's Day this sensational trio will take the stage for one show only only at the Upper Darby Performing Arts Center. 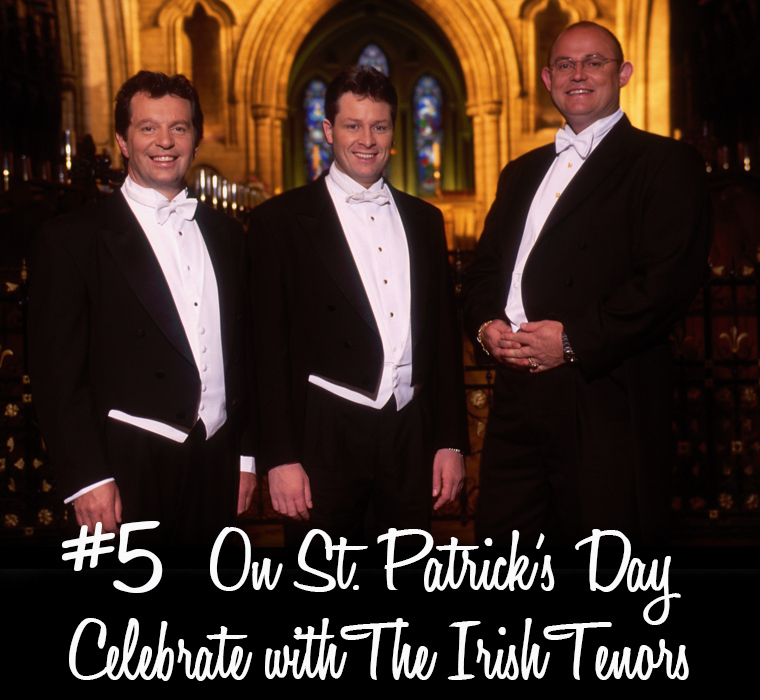 Finbar Wright, Anthony Kearns, and Ronan Tynan have been touring together as The Irish Tenors since 1998, with sold-out shows at Radio City Music Hall, Sydney Opera House, Carnegie Hall, The Hollywood Bowl, and major concert halls throughout the world. 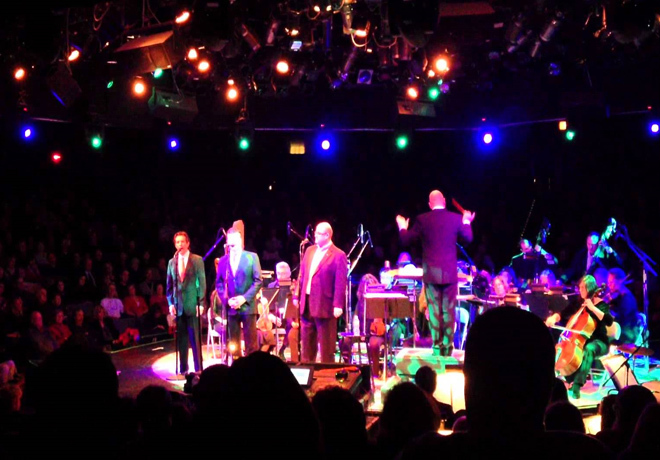 Their faces and voices are familiar to PBS audiences through several specials, including the “Ellis Island” recordings that sold a million CDs and DVDs. A concert performance by The Irish Tenors is an experience that never fails to excite audiences. If there is a single Irish bone in your body, this concert will send chills through it! Every year on March 17, the Irish and the Irish-at-heart across the globe observe St. Patrick’s Day. What began as a religious feast day for the patron saint of Ireland is now an international festival celebrating Irish heritage with dancing, parades, Irish food, green beer and shamrocks. Line the Streets at Springfield's Annual St. Patrick’s Day Parade! 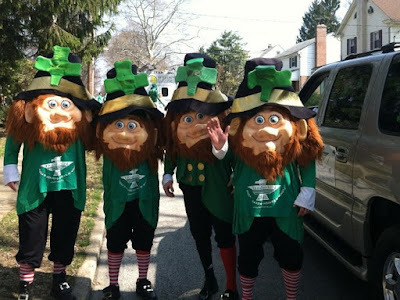 On Saturday March 12, starting at noon Springfield becomes Delco's own highway to Dublin as marching bands, dance troupes, mummers, and veteran's groups join lots of Leprechauns in a full-fledged strut saluting everything Irish and green! Pre-parade entertainment and festivities begin at 11:30am at the reviwing stand on Saxer Avenue and will feature Tom Curtis and the Irish Step Dancers. 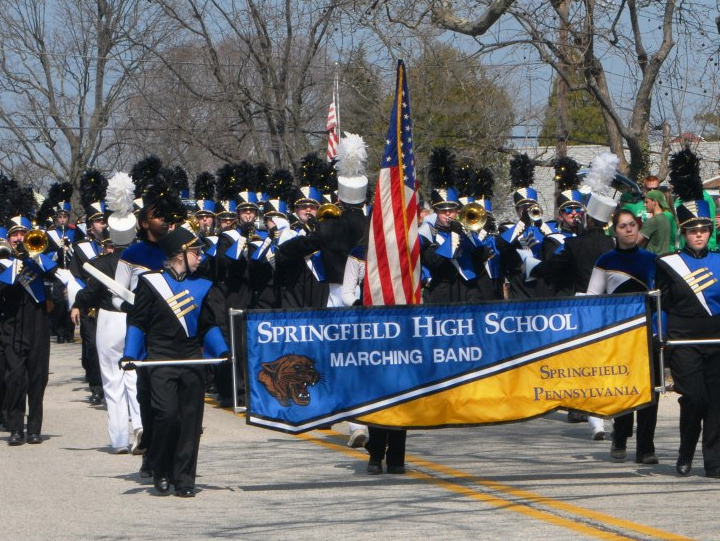 The parade route will start on West Springfield and Britton Roads, proceeding down Springfield Road, and ending at the Springfield Firehouse at Saxer and Powell Streets. Springfield's Parade is one of more than 100 St. Patrick's Day parades that are held across the United States; New York City and Boston are home to the largest celebrations. 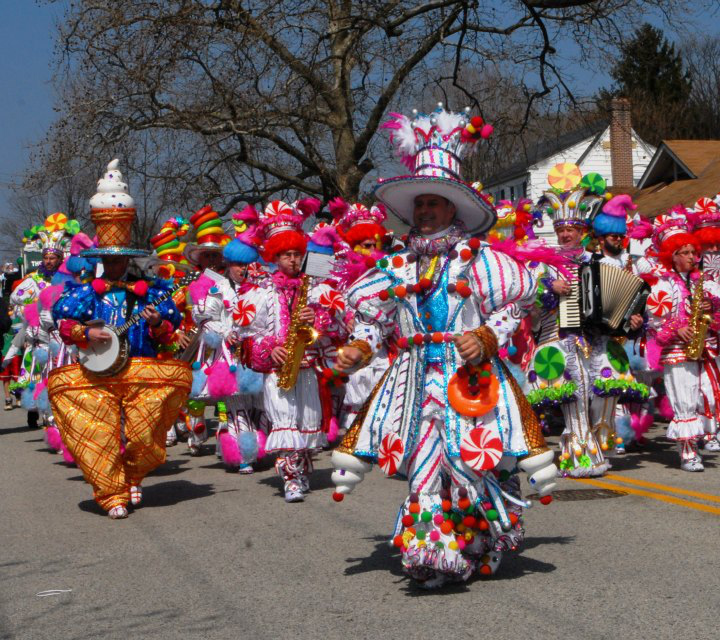 But here in Delco the crowds have a blast as local marching bands bring powerful parade music to life. 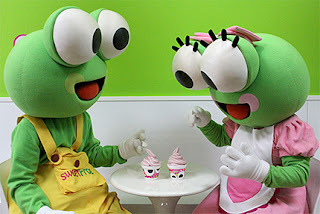 There are often costumed characters like Mr. Peanut or a quartet of Leprechauns that draw the children like pied pipers! 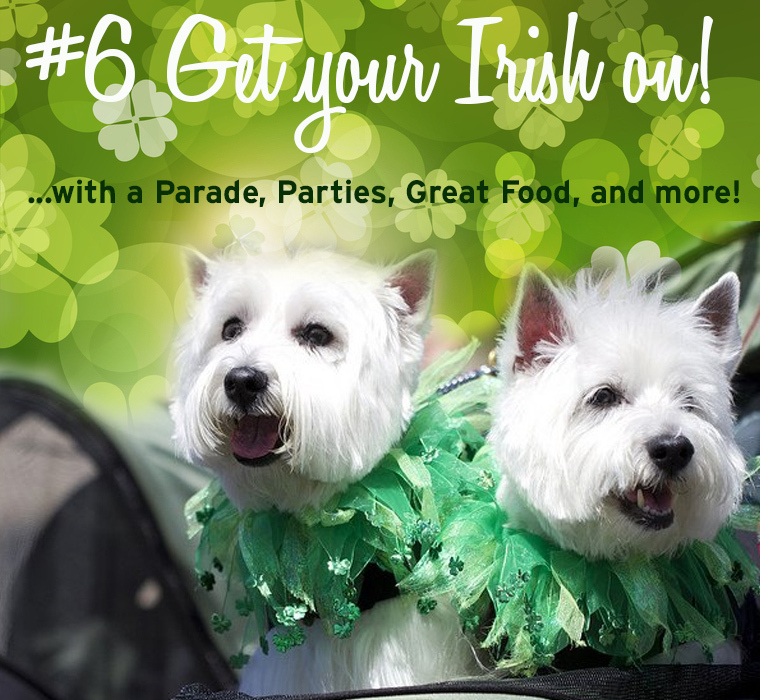 And after the parade, join the many heading for Maggie O'Neill's Irish Pub and Restaurant, a neighborhood favorite. 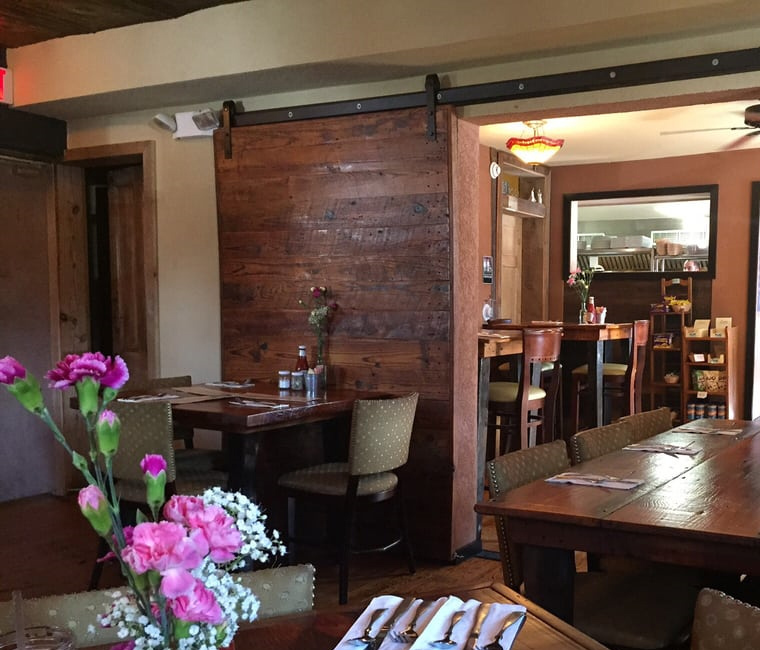 You'll find an extensive menu including Gaelic dishes like Irish Beef Stew, Fish and Chips, Shepherd's Pie, anger and Mash along with a traditional Irish breakfast. 1062 Pontiac Rd., Drexel Hill. Since around the ninth or 10th century, people in Ireland have been observing the Roman Catholic feast day of St. Patrick on March 17. Interestingly, however, the first parade held to honor St. Patrick’s Day took place not in Ireland but in the United States. 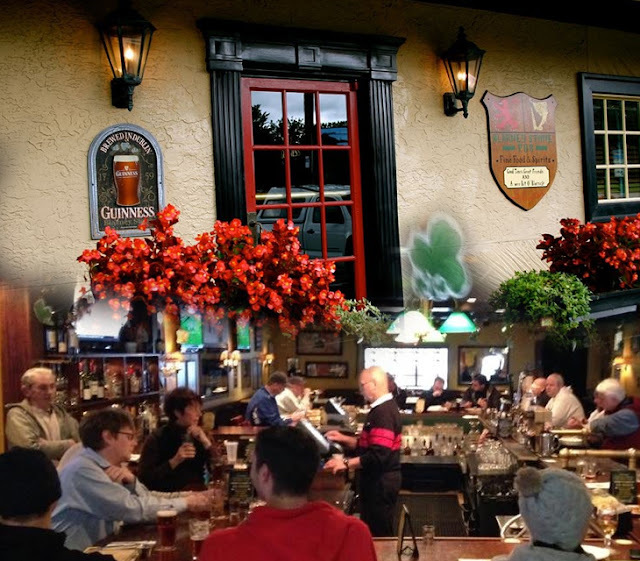 The Blarney Stone Pub is a popular spot for Delconians. It offers an American menu as well as authentic Irish fare like Welsh rarebit with Guinness cheddar sauce! Add in some games, live music and very friendly people - and you have the perfect recipe for fun! According to Irish lore, the “Blarney Stone” is said to give the “gift of gab” to all who kiss it. A wee bit of that gift has traveled to the Blarney Stone Pub where hardworking townspeople, local university students, and passersby, have shared in plentiful conversations while enjoying fine food and spirits. This outstanding restaurant is a BYOB that is always busy...and to celebrate their Irish heritage, there will be tasty food specials from 7am to closing...plus music and dancing at night to honor St. Patrick's Day! The story of McKennas begins with the story of Ann Gallagher who left Ardara, Donegal to come to America, with a passion for knitting -- and dream of one day opening a store. Soon after arriving, Ann married and raised a family in Narberth...all while knitting amazing pieces for people on the main line. And her dream of opening a store finally came true in 1980, when she opened McKenna's Irish Shoppe. Locals tell many stories about Mrs. McKenna...including knitting an Aran Sweater that Jackie Kennedy famously wore in many pictures. One store expanded to two...but as the years passed and the Internet took off, the Haverford store, then run by Ann's daughter Nancy and her husband Pat (or Squee!) was closed...and re-purposed into a restaurant and market for families to come for fine home-cooked Irish and American food. Chef Lee McCarron, born in Derry, Ireland, focuses on food that is fresh, never frozen, locally acquired and 95% of the fare originates within a 200 mile radius of the restaurant. Chicken Clare... Chicken breast topped with a Rasher, Irish Cheddar and Provolone Cheeses, served over Green Beans, and Root Vegetable Smush. Irish Fry (2 Bacon Rasher, 2 Bangor, 2 Eggs, Baked Beans, Grilled Tomato, Black and White Pudding, Home Fried, Sauteed Mushrooms and Brown Bread. I had my first Irish Potatoes when a co-worker brought some to office. She got them at Linvilla Orchards and I swear I heard angels singing Danny Boy, and a quote box sprung open in my brain saying "How the heck did you miss these unbelievable morsels of deliciousness?!" Needless to say, I have since become a connoisseur - and Linvilla's, which are always hand-made on the premises, are still my favorites. Irish potatoes and other Irish favorites will be available at their store the entire week of St. Patrick's Day. It's open daily, 9am-5pm til March 4th, then 9am-6pm the rest of the month. 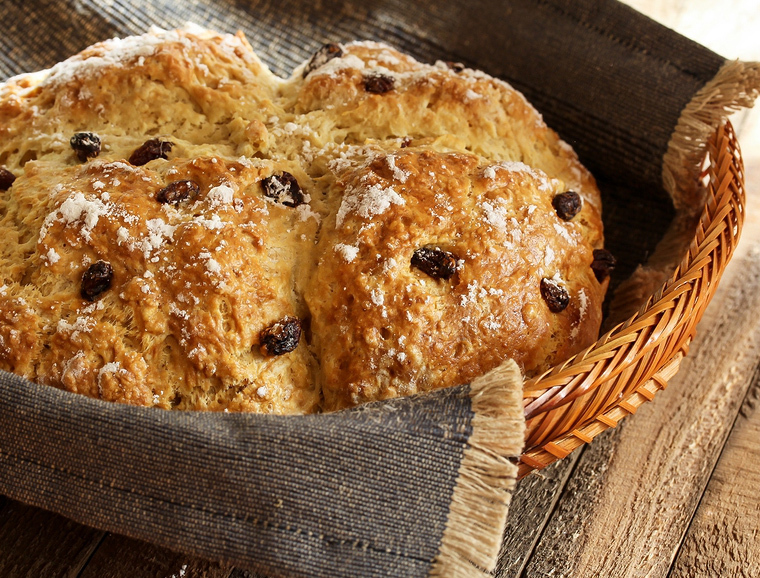 So if you're looking for sensational 'take home' Irish treats -- stop by the Linvilla Orchards Farm Market on March 17th to pick up a variety of their exclusive Irish treats including Soda Bread (pictured above) and Irish Potatoes. 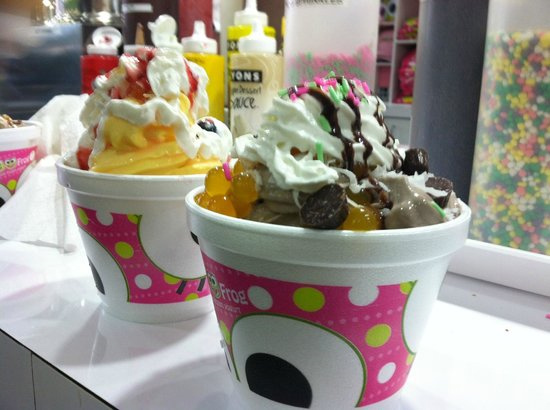 Check out Sweet Frog’s selection of creamy, delicious frozen yogurt, and for St. Patty's Day, try the Irish Mint. At Sweet Frog, you'll find a large variety of delicious flavors, a huge toppings bar, and plenty of seating. Like most Mid-Atlantic and Northern states, here in Pennsylvania our outdoor sites often close over the winter months. 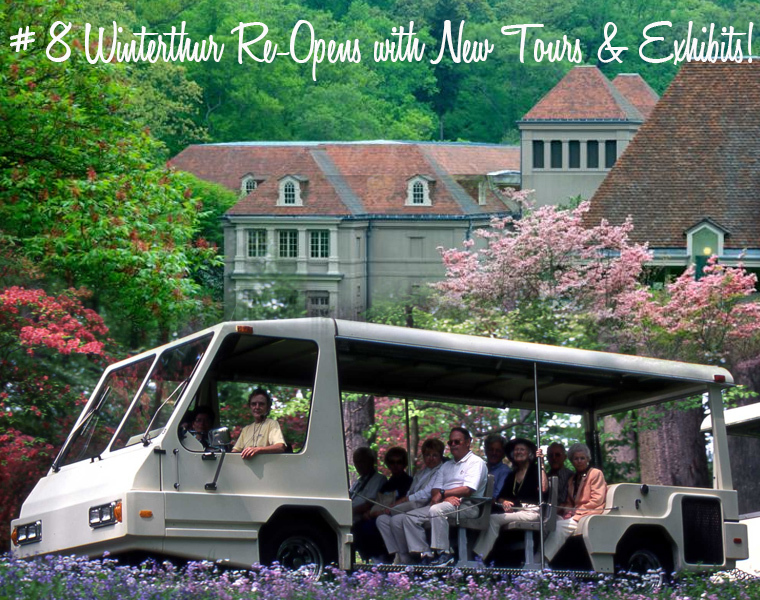 But a sure sign of spring is the re-opening of historic Winterthur (pronounced Winter-tour), when they bring tourists and residents alike, a host of new and exciting programs, collections, exhibits and tours to explore. The estate presides over 979 acres near Brandywine Creek, with 60 acres of naturalistic gardens. Initially a collector of European art and decorative arts in the late 1920s, Henry Francis du Pont became became a prominent collector of American decorative arts, building onto his Winterthur estate to house his collection, conservation laboratories, and administrative offices. The museum has 175 period-room displays and approximately 85,000 objects. Most rooms are open to the public on small, guided tours. The collection spans more than two centuries of American decorative arts, notably from 1640 to 1860, and contains some of the most important pieces of American furniture and fine art. Stroll through the Garden on your own or enjoy a narrated Garden tram tour. Be sure to take the children to the award-winning Enchanted Woods, perfect for kids of all ages. Learn about the lifestyle of the du Pont family while exploring rooms and spaces where they played, worked, and entertained. This fun, interactive tour is designed especially for families with children ages 4–11 and includes a take-home sticker album and activity book. When H. F. and Ruth Wales du Pont lived here, they called the fourth floor the entrance floor since it is where they welcomed their guests in rooms designed to create fabulous first impressions. 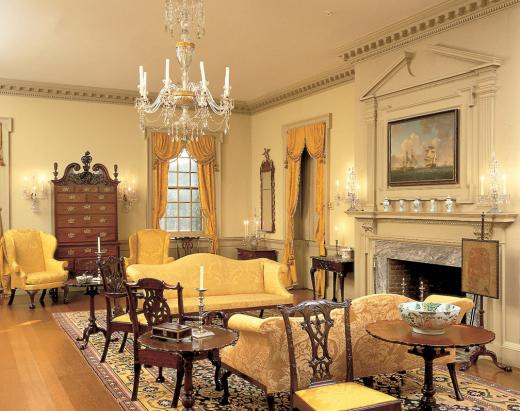 Today visitors on the Antiques & Architecture Tour will see those reception rooms and surrounding spaces filled with outstanding collections of furniture and accessories dating primarily from the 18th century, with particular emphasis on high-style Queen Anne and Chippendale furniture from the mid-1700s. 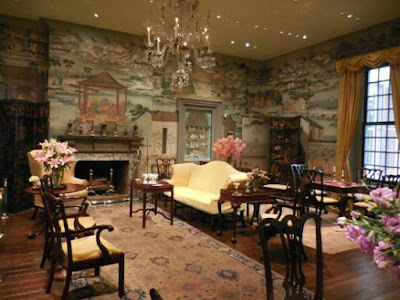 When the du Ponts resided at Winterthur, their family bedrooms were located on the 7th floor and those rooms are now included on the American Interiors Tour. Visit Ruth du Pont’s private retreat, filled with her delicate Federal-style furnishings - and H. F. du Pont’s bedroom and office suite, the nerve center of the estate, filled with the sturdy New England Queen Anne and Chippendale-style furniture he favored. Featured collections include delightful miniature furnishings, children’s tea sets, and sample pieces from the 18th and 19th centuries in the Miniature Stair Hall. The Billiard Room displays the only known American billiard table made before 1825. Snacks and lunch are served at both the Garden Cafe and Cottage Cafe. Different tours feature different areas on the estate, and may have specific requirements. Click below to email Winterthur for more information. Aviation History Magazine called it: "Best scientific outing for kids"
And Philly Magazine said: "Best science museum for children"
But you and your family will call it one of the most amazing experiences you've ever had - especially if you hop aboard a helo and take to the sky! Tickets are sold on the day of the event. 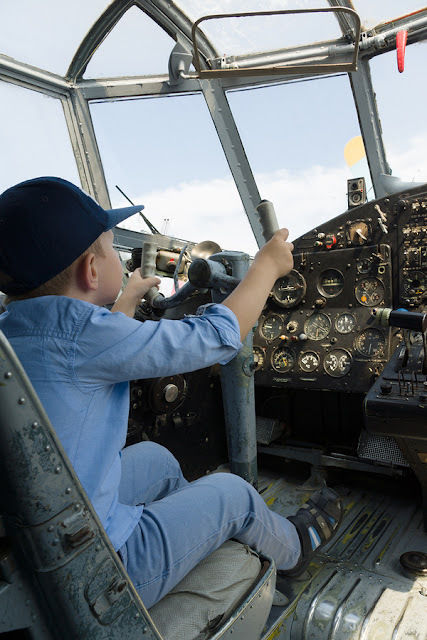 However, gift certificates are offered at the museum gift shop everyday which are good for one year and are honored for any time the museum has helicopter rides. Rides cost $60.00 per person. Children under 12-years-old, must be accompanied on the ride by a parent or guardian. Rides last 5 minutes or approximately 7 minutes with loading/unloading. This is Where Science Soars! The Museum produces dozens of exciting educational programs every year that encourage young people to explore the fields of science and technology. 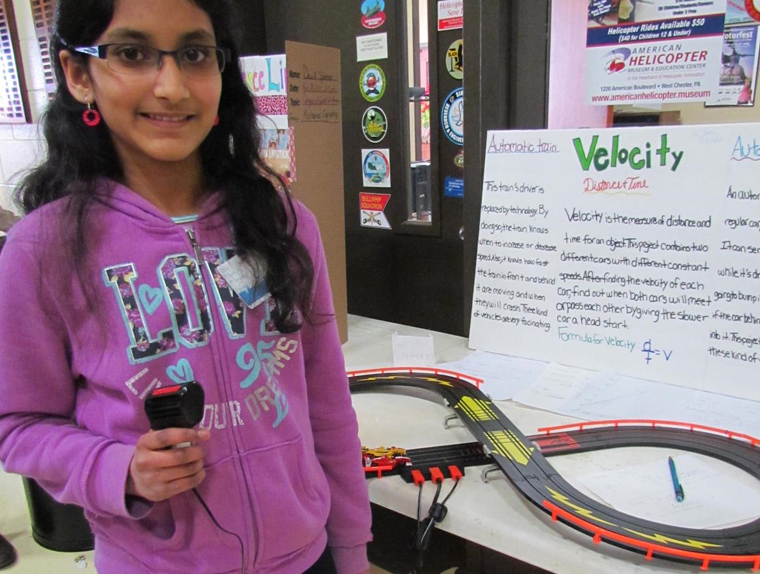 On March 18th bring the kids to the Museum's 3rd Annual Girls' Science Expo. From 2 to 4pm you can browse creative and forward-thinking science entries -- and maybe inspire your own little ones to see science in a new light! 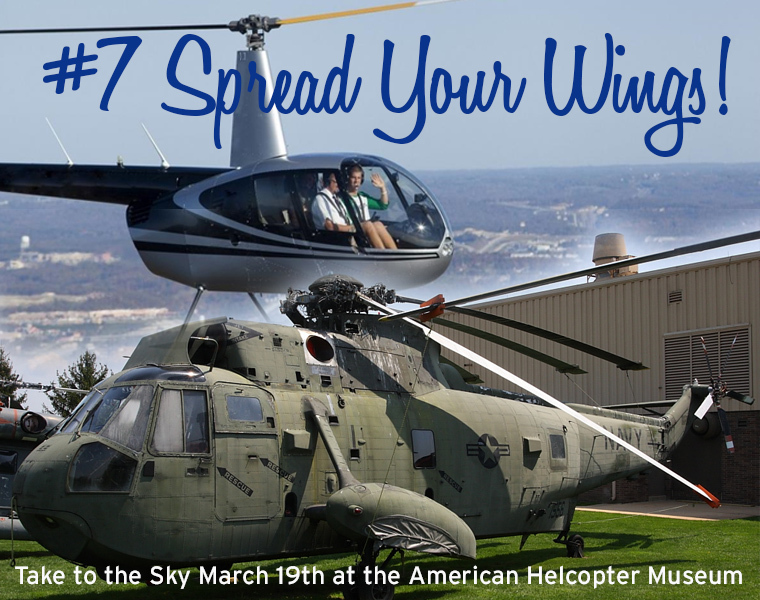 Contact Erica Zwilling at e.zwilling@americanhelicopter.museum for more information. for next year's WATP - Women in Aerospace Technology Program! 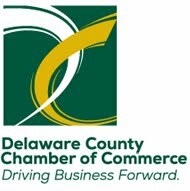 On Sunday March 5th The Delaware County Symphony Orchestra will present a full symphonic concert, Peace & Hope ... Embracing Music's Capacity to Promote Peace and Healing. 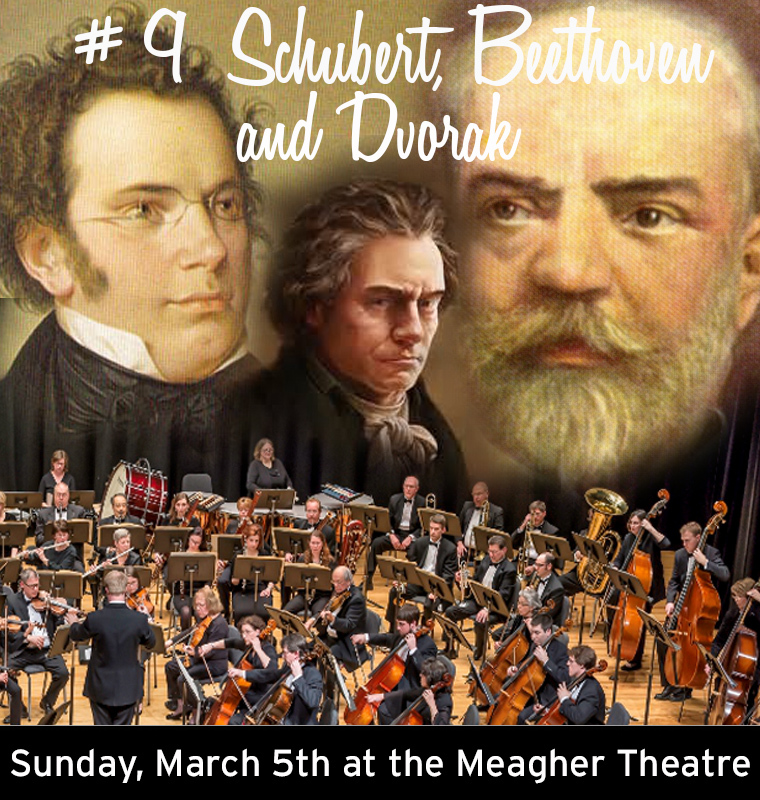 The concert opens with Franz Schubert's Symphony No. 8 in B Minor "Unfinished." What we know today as Schubert's Unfinished Symphony is only two movements, but it stands as one of the greatest, and innovative of the genre. 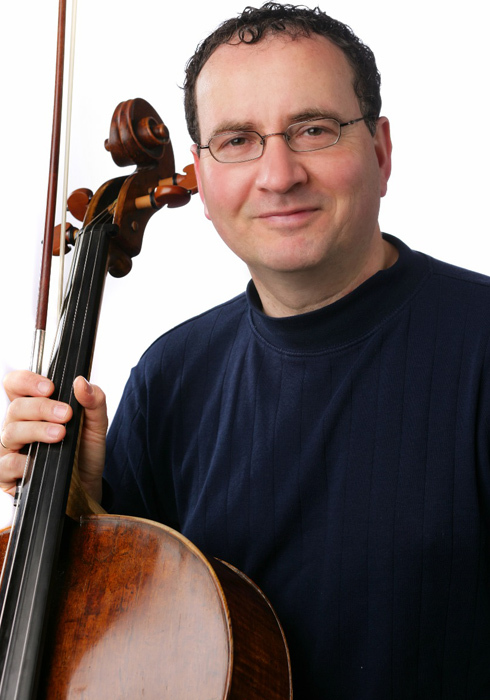 Udi Bar-David is widely considered one of the most versatile cellists in the world today. The concert continues with guest soloist Udi Bar-David, widely considered one of the premier cellists in the world today, performing Cello Concerto in B Minor by Dvorak. Winner of the 1976 International Villa Lobos Competition in Brazil and the 1984 WFLN Young Instrumentalist Competition, Udi has appeared as a soloist with the Philly Pops under Peter Nero, and given recitals in Spain and California, appeared on the TODAY show and radio broadcasts with Network For New Music. The concert concludes with Beethoven's Symphony No. 5 in C Minor. Enjoy a free informative conversation with Dr. C. Michael Kelly prior to the concert from 2:00-2:30 p.m. in the McNichol Room. Concert tickets are $18 or $15 for seniors/students. 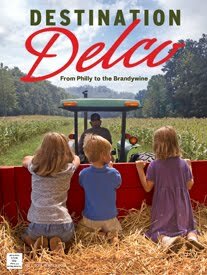 Throughout Delaware County, from the Riverside to the Main Line to the Brandywine...Summer is just plain Camp-tastic! Every kid gets a smile and a glimpse into who they might become...because there's a camping experience for virtually every age, and every interest! 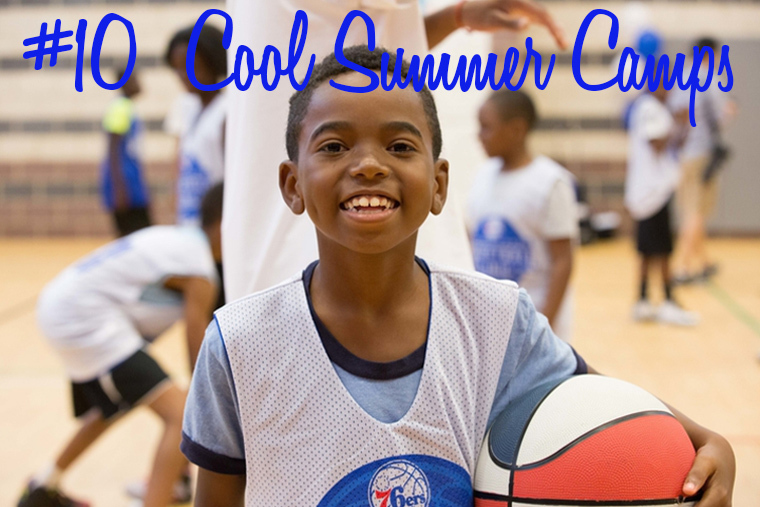 There are 76ers Basketball Camps...Theatre, Dance and Crafting Camps. Don't forget the Garden Camps, History Camps...and the ones listed below aren't even all the camps! But here's a variety of camping experiences sure to put a big grin on your child's face this summer! (1) "SHOWTIME" DAY CAMPS are held at Cardinal O'Hara High School Aug 7-11 for boys and girls ages 7 through 13: Monday through Friday from 9:00 AM to 4:00 PM -- Cost is $425 per child. Ball Handling - How to protect the ball and dribble with either hand. Passing - 5 basic passes and when to use them. Learning how to shake your defender and get in triple threat position. Rebounding including how to box your man out and attack the offensive boards. 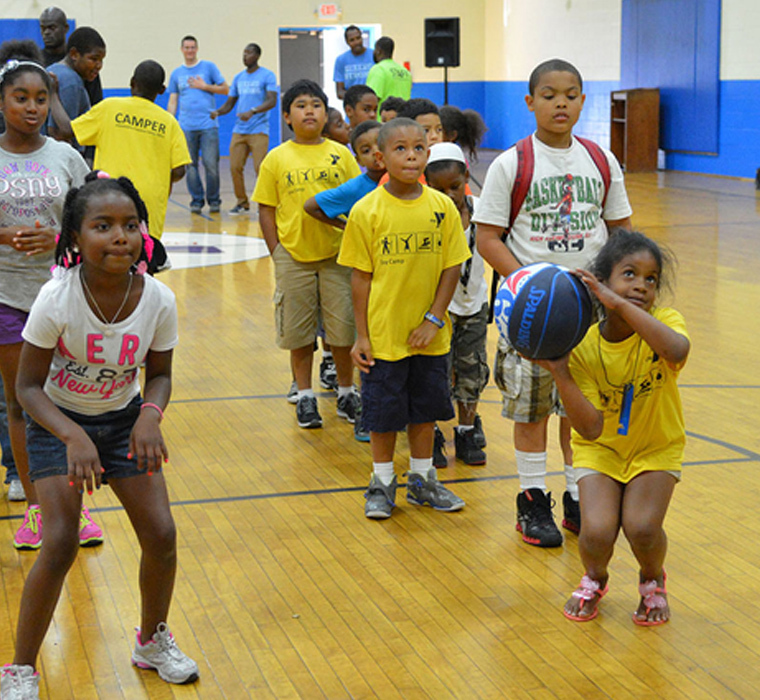 Plus there are Little Sixers Day Camps for those 5-7 years old. (2) 76ers Overnight Basketball Camps -- Five Day Clinics conducted throughout July at Valley Forge Academy and College in Wayne. 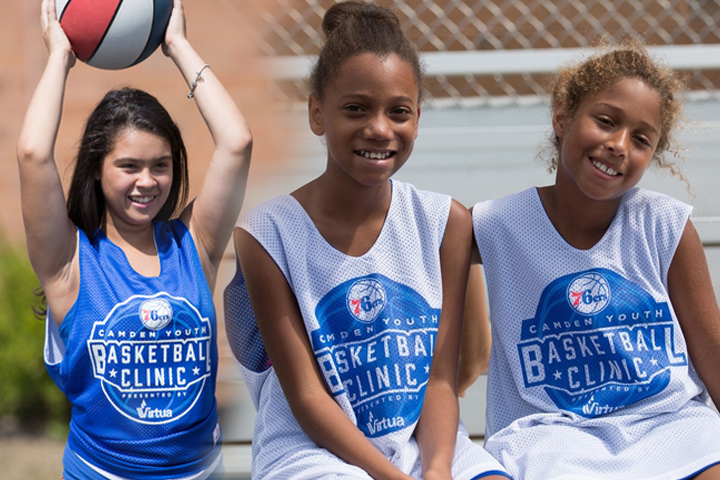 Since 1985, 80,000 campers from 40 states and 30 countries have made the Sixers Overnight Camp the premier location for fundamentals and skill development. Each session is complete in itself and runs for 6 days of teaching, fundamentals and skill development-as well as 2-3 games daily. 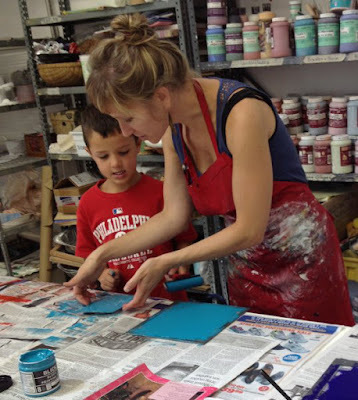 Campers can elect to attend one, two, three, or four sessions which include a fully supervised between sessions program. 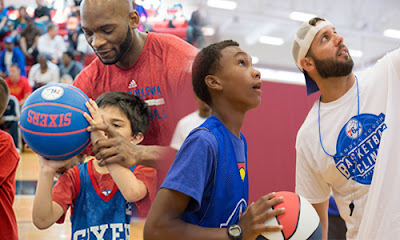 The Sixers Camp is geared for campers of all skill levels with 5 leagues each session. Those campers wishing to improve a specific aspect of their game can choose individual instruction on a daily basis as one of their camp activities. The cost is $720 per session. Send your kids on an Adventure! Exploration. Learning. Friendship. Fun. These are the values that underlie every activity the camp has to offer. When you send your children to Summer Discovery Camp, they will be immersed in a unique community that encourages them to follow their passions and discover the world around them. They shouldn't be afraid to get dirty while learning new skills, trying new things, and expanding our abilities! Whether looking for tadpoles, creating cloud-inspired art, making ice cream, floating boats, or meeting a box turtle, they support campers’ curiosity and encourage play and creativity. 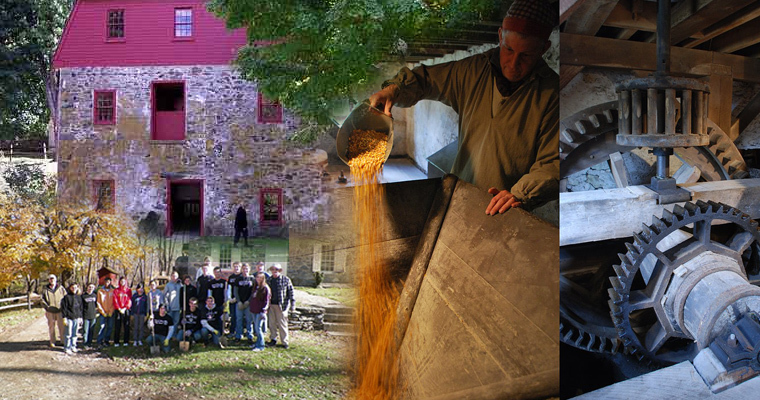 Summer Discovery at Newlin Grist Mill offers history and nature-based experiences in an engaging outdoor environment. Through exploration, enthusiasm, and respect, campers share unique experiences that connect and expand their interactions with each other and their community. Many exciting sessions are planned for 2017 -- but here are just a few samples! Who lives in that tree? What left that track? Who ate that leaf? DIY detective kits, treasure hunts, and nature disguises! Plus here's a sampling of just a few of their exciting AFTERNOON ADVENTURES! Campers discover the ingredients of ice cream and where they come from, test out three different methods for making ice cream, and vote on their favorites! Campers discover the tools and techniques of archaeologists as they screen soil, clean and assemble artifacts, and learn how to read the stories they have to tell. creatures work together to form a food web and create a pond life-inspired work of art. 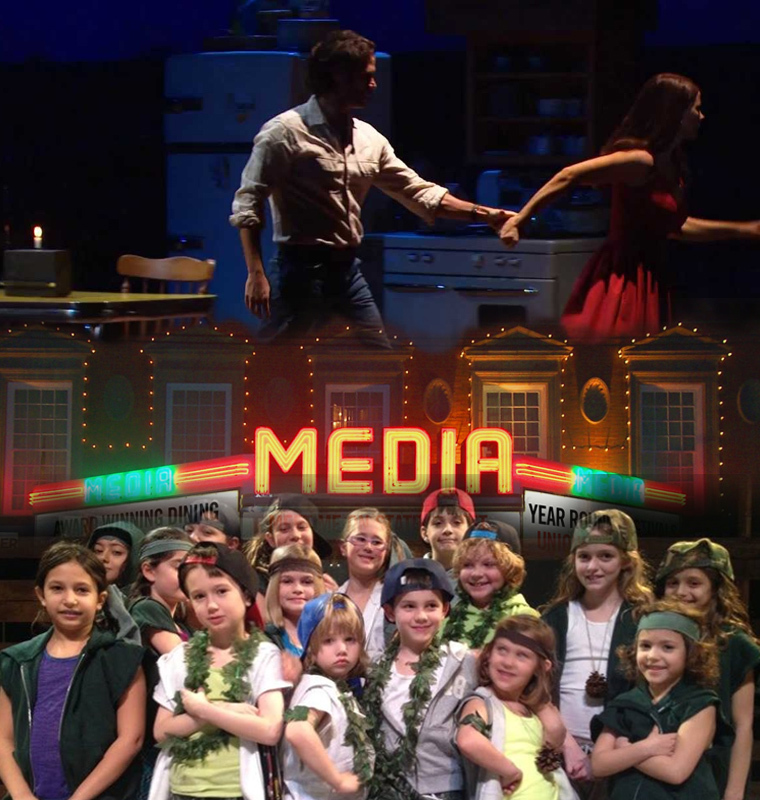 Camp Media Theatre 2017 is an extraordinary and exciting opportunity for young actors to sing favorite songs from Broadway shows, create their own scenes, rehearse, and participate in an improvisational theatre production that is performed on the Media Theatre stage for family and friends the final Friday evening of each camp session. The unique and exciting experience begins June 12 with a special one-week day camp, and then continues with five two-week sessions. All day camps meet from 9:30am-3:30pm Monday through Friday. There will be ‘themes’ with each two-week session based on the songs being used within the camp. 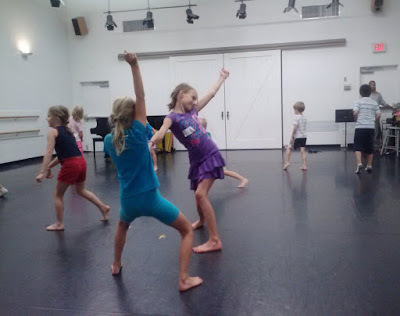 The focus is on learning and maintaining basic stage skills in singing, acting, and dance. Ben Kapilow, Music Director; Andrew DePaul, Acting Instructor and Assistant Manager; Lydia Krull, Choreographer; Tim Haney, Show Director; Kyleigh Bleacher, Counselor/ Educator; and Roger Ricker, Camp Manager. The theatre’s Artistic Director Jesse Cline created Camp Media Theatre in 2000 and continues to have a hand in its development. 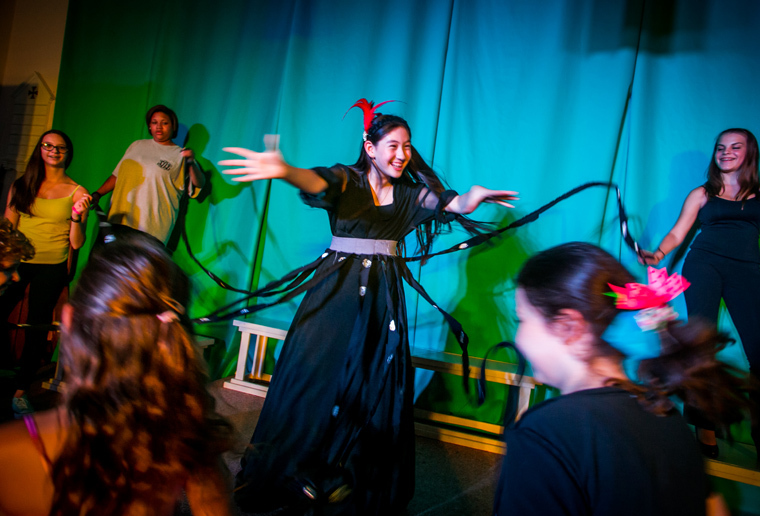 With interactive, creative one-week camps as well as two- and three-week full production performance classes, Hedgerow Theatre Summer Camp invites children to come play in The Secret Garden, journey into the imagination -- and put on a fabulous show! Hedgerow believes creative play is vital to the growth of every child and an asset leading to success. Understanding literature, thinking creatively and critically while building one’s own unique voice through communication skills prepares each student for this century. 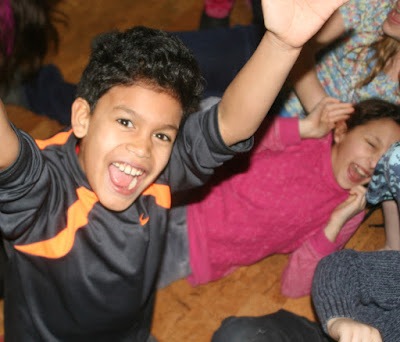 Stories, songs, and dances are chosen to help each child play at his highest level: verbal skills, physical movement, public speaking, and intense imagining are all heavily stressed in every camp. Join Hedgerow this summer for one creative journey after another. · Half Day (9:00 a.m.-Noon) available upon request. For more specific details on camps and costs, click the link below. From Drama to Dance, Music to Visual Arts, Darlington offers inspiration for creative young people in a variety of media! Pre-Camp for Preschool introduces children ages 3-6 to camp in short, half-day sessions. Structured like a day of preschool to include welcome and goodbye time, snack break, and free play along with arts activities. All Pre-Camp for Preschool sessions run from 9:00am-12:00pm. 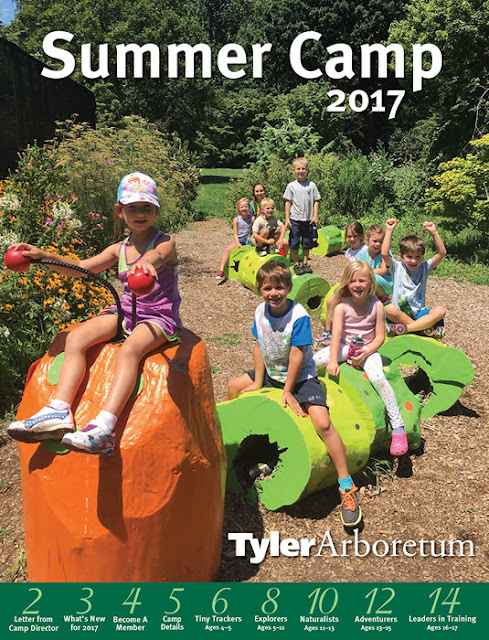 If your child loves the outdoors, Tyler Arboretum’s Summer Camps do an amazing job connect ing children with nature as they explore our unique and diverse ecosystems. 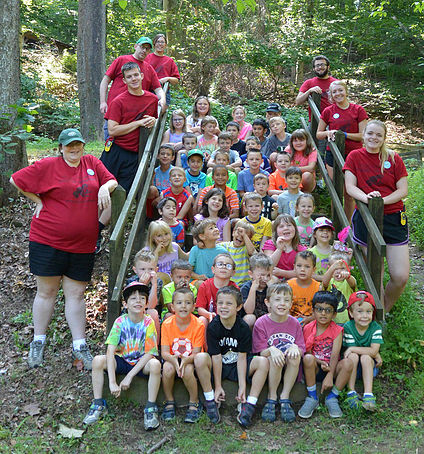 Enthusiastic, highly-qualified staff and low student/teacher ratios facilitate fun, interactive learning through nature and stewardship projects, games, naturalist-led learning sessions, crafts, and hikes. But What’s New for 2017? Your children will enjoy the personal attention of a 1:4 ratio of staff to camper, ensuring unparalleled enrichment and fun! Double the Counselors, Double the Fun! Children will have even more personalized attention to help them explore the great outdoors, develop confidence and make new friends. 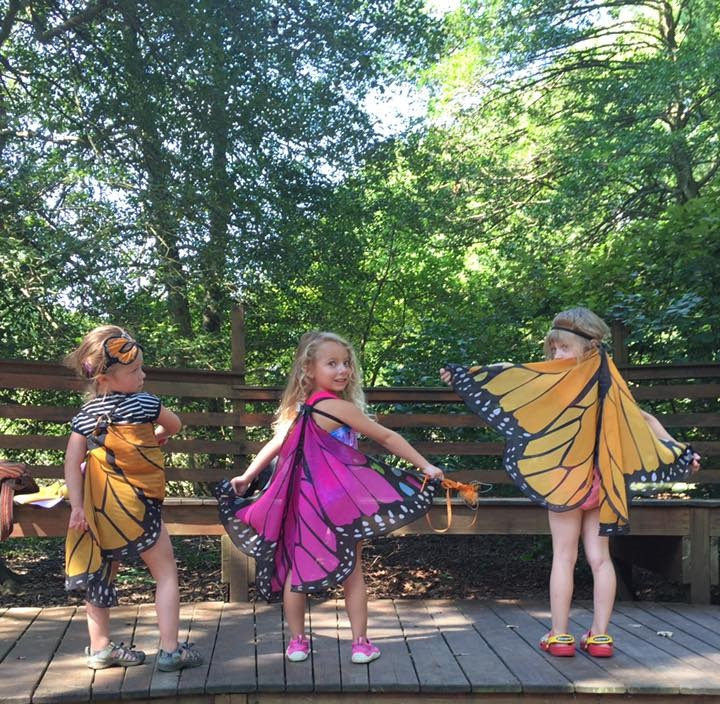 This year they have added another Nature Specialist to allow your children to spend more time with experts, diving deep into our beautiful landscapes and ecosystems with fun activities and exploration designed to help them experience nature in meaningful ways. This new role within the camp supports the daily needs of campers, and offers better communication with parents every day. During this patriotic mini-week (July 5-7) they will break the entire camp into three teams, to compete in a series of games, races, challenges and hunts. Spend the week with campers of other ages to earn points in a variety of messy, silly, wild, and funny challenges. Bring your patriotic colors and your team spirit and join the summer madness! See individual age groups for more information. 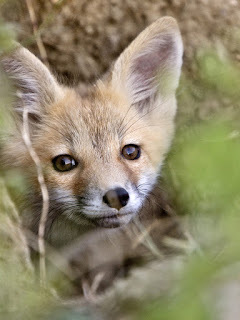 Tyler is now offering more programs for Naturalist (11-13) and Adventurer (13-15) age groups. Naturalists will run every week this summer, and some weeks we offer two groups … that’s double the kids! Adventurers will expand to 5 weeks this summer with amazing trips and overnight experiences. Designed for ages 16-17, these three-week sessions will help teens develop leadership skills while having a blast swinging from trees in high adventure activates, and surviving in the woods with their newly developed outdoor skills. Teens will walk away from this three-week experience with confidence, leadership skills and awesome new friends. For over 40 seasons this invaluable program has has become the gold-standard for youth theater programs. 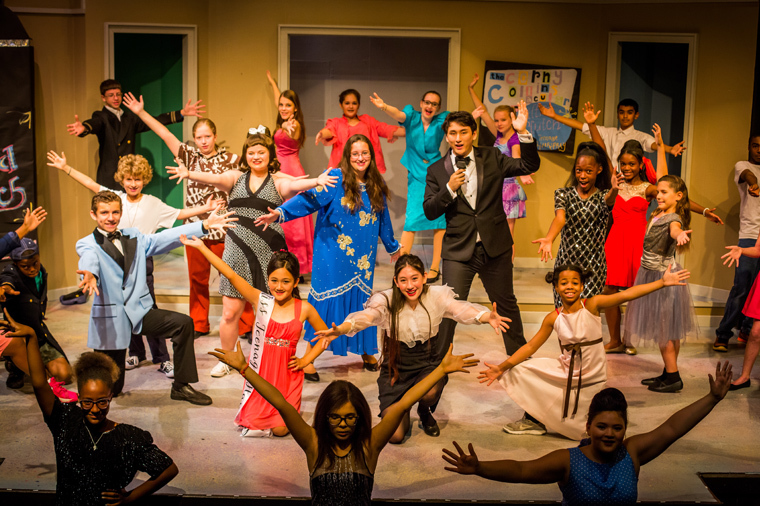 The Upper Darby Summer Stage is one of the nation’s most successful youth theater programs. Learn the art of live theater from a staff of 100 theater professionals. What does it take to put on a professional-quality show? 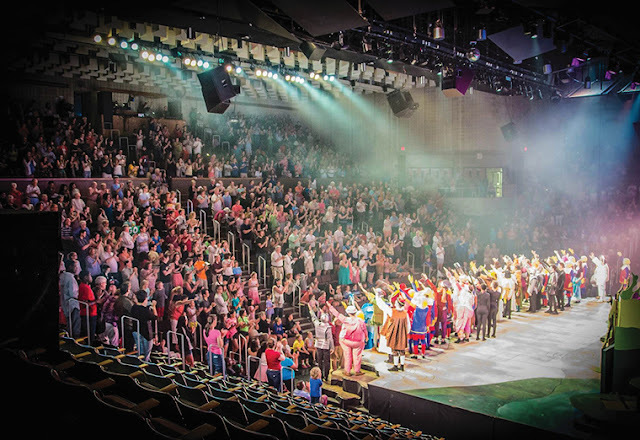 You will learn from the region’s talented directors, choreographers, lighting designers, costumers and enjoy performing in front of one of the largest audiences in the region! 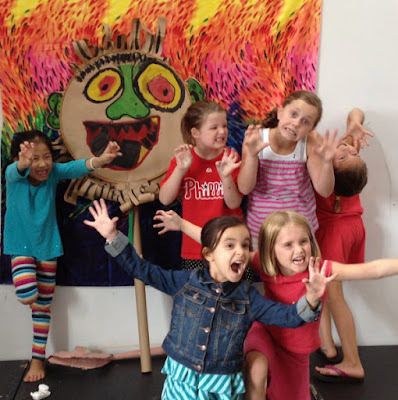 Our Apprentice and Rising Stars programs prepare you for the excitement of our Children’s Theater program. Not a performer? Join our Technical Theater program and learn painting, construction, lighting, sound and costumes! 2017 online registration is open and you can register by clicking on the link below. Or call the Box Office at 610-622-1189 for more information. Participants must be 11 years of age by June 15, 2017 or finished 5th grade. Classes are offered in acting, movement, music and storytelling from 8:30 to 11:30 am Monday through Friday. Participants must be 13 years of age by June 15, 2017 or finished 7th grade or must have completed a full session of the Apprentice Program. 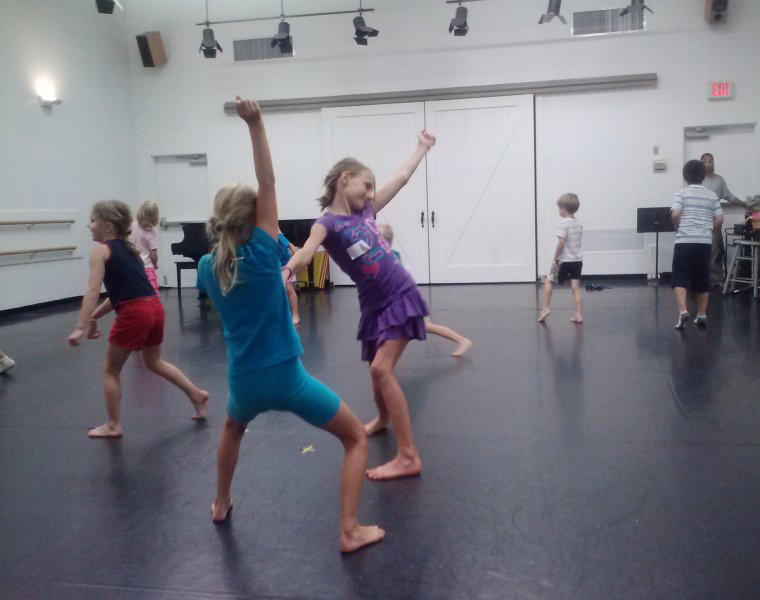 Classes are offered from 1 to 4:30 pm Monday through Friday and will culminate in a performance of a children’s musical. First time members of the Children’s Theater Program participate in one of our six shows presented for a children’s audience. Performances are Tuesday through Friday at 10:30 am and Thursday evenings at 7:30 pm. Rehearsals are held in the morning from 9 am to 12 noon and in the afternoons from 1 to 4:30 pm. There will be one weekend rehearsal for each show. Children’s Theater is not all day every day.